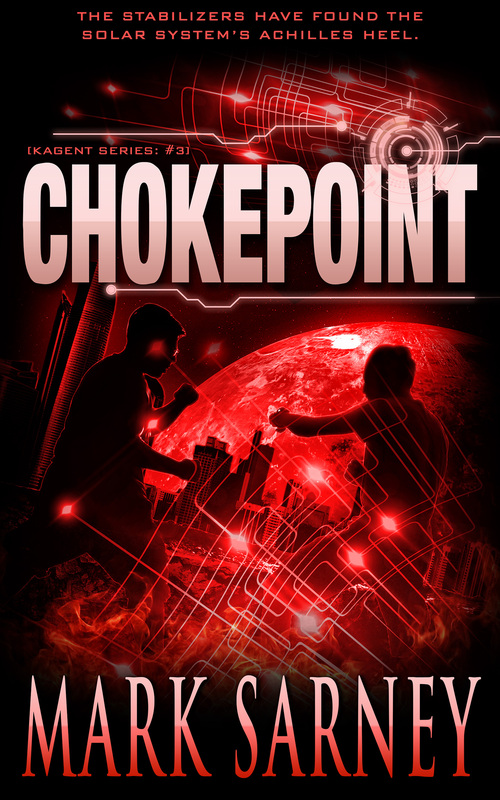 The e-book version of my third Kagent novel, Chokepoint, goes on sale on Amazon on October 10th – this Saturday! You can pre-order the book right now! Do it, or a bounty hunter will run you down and zap you with a dozen old, clattering drones. Nick and Pam chose the worst time to start a family. Craig Lassiter’s Stabilizers have cut off Earth’s exports to the offworld settlements. Floating Venusian cities begin to crumble as fuel prices spike, causing Tessans to starve, and the offworld economies to grind down into an existential depression. And this offworld disaster is where Nick and Pam are forced to find refuge, because Earth is worse. Borbola has besieged the Kagents on all sides: they are demonized in the media, they lost access to Earth’s databases, and the bounty hunters are killing them. It’s all Nick and Pam can do to avoid the bloodbath and leave Earth for the last time. The Kagents have one lousy chance to save the offworld societies: defeat an overwhelming bounty hunter force on Venus, and gain control of Earth. But when the battle goes south, the best Nick can hope is that his death will be enough to save all offworlders, including his newborn child. The paperback version will be out shortly, for those of you who want to feel the creamy pages of heart-thumping action in your wee sweaty hands.